Above is the link to the article you mentioned. I agree, spring 2015 is a long time for them just to have the sites ready. I initially expected them to at least be almost finished construction of the already-signed businesses by then. Oh well, good things come to those who wait. An official said a new standalone restaurant planned for there alone could net up to $15,000 in taxes for the city, and maybe pull from other restaurants...WOW I wonder what that chain that is going to be. I don't know how those numbers compare to average for a restaurant (perhaps someone else could answer that) but it sounds like a big deal to me. Someone else in the article mentioned they need more kids in the mall. Umm…sure as long as they are well-mannered kids. One of the main complaints I've had a couple of times with the Valley Mall is the abundance of trouble-making kids running around. I've been in there a couple of times where multiple security officers had to be called in to control rowdy groups of teens. Also, Martinsburg Mall used to have a problem with kids skipping school at nearby Martinsburg High and South Middle causing trouble in the mall. In fact at one point they didn't allow anyone 18 and under to enter the mall without adult supervision during school hours. I agree we definitely need stores for the young demographic (Hollister and Abercrombie would really pull from other areas, there are currently 0 Abercrombie stores in WV and the closest to Martinsburg is Dulles Town Center) but we also need some stores that would attract other demographics as well. I think a Charming Charlie store would do well here as long as it has an exterior storefront. I know a couple of ladies who shop there, closest location is in Leesburg. Unfortunately, its the worst nightmare imaginable for us guys (haha), but the ladies love it. It's elaborate clothing and accessories but reasonably priced. I will admit it is kind of cool because the entire store is divided by color. For instance, all red clothing and jewelry is in one corner, yellow in another section, so on and so forth throughout the store. It's different and innovative, nobody else in the four-state has it, and although like I said it is a guy's worst nightmare, I'd like to see it come for the female demographic. I've always heard, at least from borough government officials in Chambersburg, that restaurants bring in very little revenue to the borough. It was in a PDF, Q&A type of thing. Maybe they were comparing it to residential development, I have no idea. Although, restaurants to attract highway travelers and retain shoppers, that's indisputable. It's a win-win for Martinsburg considering Sears, as a company, will probably leave many open storefronts in malls. I found the "we need kids" comment a little strange too. Maybe he was saying that the mall needs some trendier, younger stores, but it came out in the form of the "we need kids" comment. Bad stores will absolutely kill a mall. Chambersburg mall has had one foot in the grave for years. Coupled with its odd location in the country, it's a laughingstock. 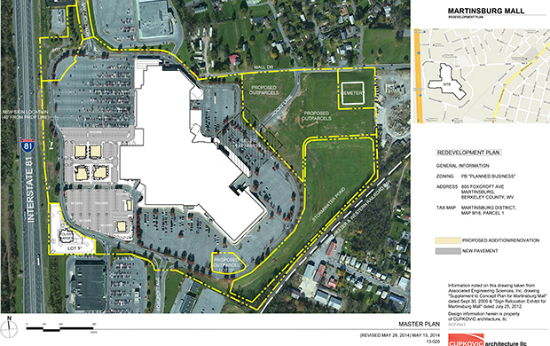 Restaurants won't build on the mall's pad lots because Greene Township is dry (PA needs liquor reform NOW). I think there's hope left for Martinsburg Mall. The location is excellent, there are great restaurants around (and more to come), and Wal-Mart surely brings plenty of foot traffic to the general area. Post-recession, I'm sure most malls are having trouble finding quality tenants. With a little time, I'm sure Martinsburg Mall will be in better shape. It's funny that you mentioned Charming Charlie's, the women is my family act like that place is Shangri-La! It would definitely bring women from the four state to Martinsburg Mall! Top left- A woman's clothing retailer, like Dress Barn, Cato, Lane Bryant, etc. Top right- Something for younger people, like Rue 21. Larger, bottoms building- That looks like a Panera Bread. Look at an aerial view of the Chambersburg location, it's a similar shape and size. You can see a drive-through lane as well, something that most Panera Bread locations have. Half of the proposed buildings have been leased, so that's a good thing. The statement about the mall being too large is kind of odd. Of course it would be hard to find a direct successor for the Sears space, department stores in the mall format are a dying breed. The mall doesn't seem too large, it's just an older style shopping center. How about a Town Center dressed up to look like a mall or is it a mall dressed to look like a town center? The Dulles Town Center is physically an indoor shopping experience but the fact that they call it a town center vice Dulles Mall say anything? Hmm, did I word that correctly? As often as we've been there (mostly on a Saturday), I have yet to see it with hardly anyone around. It always seems so busy. Hopefully these new changes will bring more people and with that more $$$ to this area. If they were going to tear it down, it would probably take a while to "empty" the mall. Anchor stores usually lease their buildings for longer increments. Last edited by mmccul; 12-13-2014 at 03:22 PM..
That's really neat imaging software! It looks like the existing building will be demolished. It's in a good location. "Shoppes"?? What that tells me is that they think we're rubes easily swayed by pretention. Has anyone heard what stores and restaurants will sit where the old Sears was? I've been waiting for an article about future tenants for a while.